Egypt, looking elsewhere to fill its energy needs amid a row with Saudi Arabia, signed an agreement with a Kuwaiti firm that will give Cairo a 20 percent stake in an Iraqi oil field. Egypt will get a 20 percent interest in the Siba oil field. Kuwait Energy Plc signed an agreement with Egypt General Petroleum Corp. (EGPC) for a 20 percent participating interest for the Siba Field in Iraq, the company said in an emailed statement on Oct. 26. Egypt-Saudi relations hit a snag last month after Egypt voted in a UN Security Council session to support Russia’s draft resolution concerning the situation in Syria. Soon after, Saudi Aramco informed EGPC that Aramco was suspending exports to Egypt for the month of October. 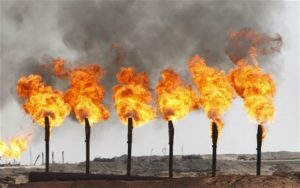 The agreement with Kuwait Energy, signed in Egypt on Oct. 24, remained subject to Iraqi regulatory approval. Kuwait Energy was awarded a 20-year gas development and production service contract for the Siba Field in 2011, receiving operatorship and 45 percent revenue interest.